Truth or fiction, judge for yourself but the community in Dapote village Hwange is convinced there is an invisible man believed to be jealously guarding a trailor that was left behind some five years ago. 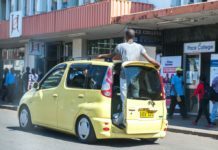 A breakdown at a bus stop known as “ko- mc gyver” in Dapote Hwange by a motorist in 2013, saw the motorist allegedly leaving behind a trailor he was drawing. Today the trailor has become the centre of bizarre as the community alleges anyone who dare tempers with it, is met with instant retribution. The narrative alleges after the breakdown, the owner assigned two locals to keep watch on his property. With time one of the men is reported to have passed on and a search for answers by this news crew took it to a homestead believed to be that of the other man. Sadly the trip yielded no joy as the homestead was deserted. Ironically the villagers said none of the locals have been slapped and further allege the victims of the imminent retribution are often drivers of passing vehicles who want to take advantage of the disused trailor and steal its parts for personal benefit. “The problem is with drivers passing by because they know they will get a lot of money if they take out some parts and sell them. In our case we don’t even know where to sell them and for how much so the drivers are the people that have fallen victims,” said one of the villagers. Out of curiosity some locals just pass-by to see what will happen, but many are scared and will not let their children go there. The villagers could however not give any assurance to this news crew that filming would be done without a slap, thankfully the team left the scene without an incident.